We all know the saying, and most of us will wholeheartedly agree that it’s unfair. But, get the cover wrong on your book, and that is exactly what happens. Your book will be judged negatively and readers won’t buy it. That’s the reality. We do judge books by their covers. Just the same as we judge people by the way they dress, judge them by what car they drive, what house they live in, and we even judge them by way they walk and talk. People make connections, sometimes correctly, sometimes incorrectly, between the quality of the cover design and the perceived quality and content of a book’s interior. So if your cover is poor, they will assume that the interior is going to be poor too. If readers think you haven't spent enough time and effort on the cover, they will wonder if the content is worthy of them investing the time and effort to read it - and may move on to look at the next book on the shelf. Don’t shoot the messenger here - I’m just telling you how it is. So where do you start on cover design? Some will tell you that there are no hard and fast rules. But, talk to the creative experts, and they will tell you that design should always reflect content. Don’t mislead the reader with the cover. A good suggestion to help kick off the process is to delve into the book and put together a mood board. As a former Scotland Yard detective, I write based on true events and on actual police investigations. My thrillers revolve around a wayward investigator called DI Jake Flannagan. Jake sails close to the wind, but knows the streets of London like the back of his hand, as he chases around uncovering the motives behind real-life crimes. So with that in mind, there are some things that I wanted to include on my cover. The Detriment is set in the summer of 2007, primarily in London, just as we ushered Gordon Brown into the Houses of Parliament as our new Prime Minister. On my mood board, the Palace of Westminster features heavily. As one of the capital’s most iconic silhouettes, it’s perfect for communicating to readers the book’s geographic location. The story features explosions and incandescent blazes - and I wanted to use rich, warm tones and colours on the cover to reflect the heat and fire featured in the story. The Thames also has a key role to play in the book, almost as a character itself, so it was important to me to feature this element of London too. This is the second book of the series, so the next challenge was to ensure the design was in-keeping and consistent with the first. I want readers to be able to identify that this is a new Detective Jake Flannagan adventure – so we’ve used similar design rules and the same typefaces as we did on Jake’s first outing in The Theseus Paradox. Because this book is not an identical journey, however, we have moved the series on using some subtle design differences. The Detriment means ‘a cause of damage or harm’ or ‘the state of being harmed or damaged’. And there is certainly plenty of that in this book. With the story featuring devastating bomb plots, we’ve mirrored this with the use of an unusual, damaged texture on the title words. Many of the most significant public buildings in Whitehall, Trafalgar Square and the City have been constructed or faced in Portland stone, a limestone from the Jurassic coast of southern England. We’ve filled out ‘The Detriment’ lettering using a fractured, white-grey stone to represent the damage that London’s architecture has undergone down through the ages. After I had worked up an outline idea of what I wanted - it was time to engage with the professionals and use their expertise to execute the plan. And that’s a really important part of this process. Using experts in the field of book design is paramount, because people really do judge books based on their covers. And where book marketing is concerned, better a hard truth than a comfortable delusion. 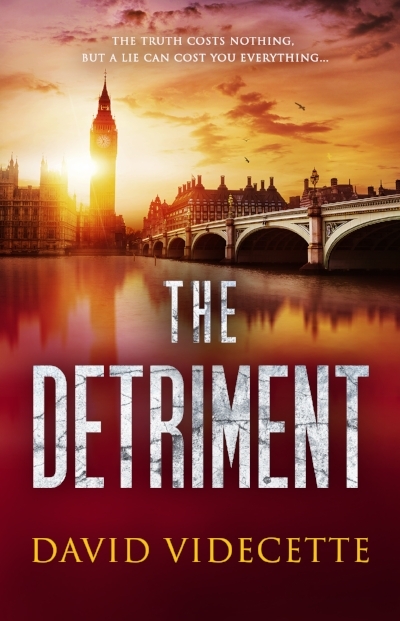 The Detriment is out on 29th June and can be ordered on Kindle or in paperback. From the author of ‘The Theseus Paradox’, the smash-hit 7/7 thriller based on true events, comes the sequel about a real-life mystery that threatens to destroy a nation. Detective Inspector Jake Flannagan must uncover how a series of astonishing real events are inextricably linked, before the past closes in on him. David is proud to support the Police Dependants’ Trust through sales and downloads of his books.